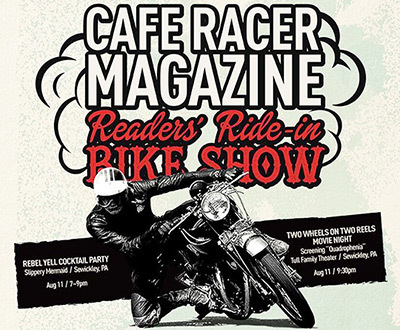 10th Annual Cafe Racer Magazine Reader’s Ride In Bike Show. Published by Cyril Huze July 28th, 2017	in Builders, Customs and Events. The event in on 2 days at Sewickley War Memorial Park, PA . August 11, 7 to 9 pm Rebel Yell Party. At 9.30 pm, Two Wheels On Two Wheels Movie Night with “Screening” of “Quadrophenia” at Tull Facility theater. August 12, doors open at 10 am for Bike Show. 6 judged bike cklasses, $3000 in prizes and trophies. $10 bike registration. $5 admission. More info at Cage Racer Magazine Bike Shows. i didn’t know this magazine was still in existence.